Services: branding, email newsletter, web design. “Curious produced a unique and engaging visual identity, website and newsletter which matched exactly what I needed from my online identity. People have often remarked to me how good the website and emails are, and they have had a very positive impact for me in terms of attracting work. 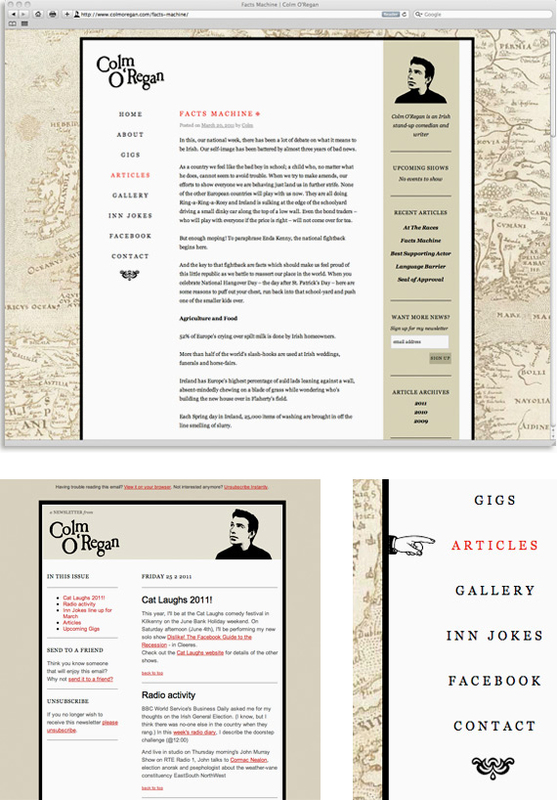 Colm is both a comedian and a writer, so he wanted his website and newsletter to have a quirky design with literary references. We took inspiration from the design of old books and maps to create an unique identity for him. Colm needed his website and newsletter to be simple to edit and change as he updates them frequently. Our email newsletter manager allows Colm to manage and send his emails himself and we built his website in WordPress so he can easily add articles, gigs and news.